Acting Governor Richard J. Codey and the Department of Education announced the 22 schools named 2005 Governors School of Excellence Award winners for the significant efforts they have made to improve over the course of two school years. Lincoln Elementary School in Hasbrouck Heights was a recipient of the Governors School of Excellence Award. The Lincoln Elementary School staff nominated two teachers, Mrs. Kathy DiGuglielmo and Mrs. Lynne McGreevy, to accompany the Superintendent of Schools, Mr. Joseph Luongo, and the Lincoln School principal, Dr. Patrick Ciccone, to the recognition ceremony Tuesday, November 22nd at the Masonic Temple in Trenton where the school was awarded a $25,000 check. 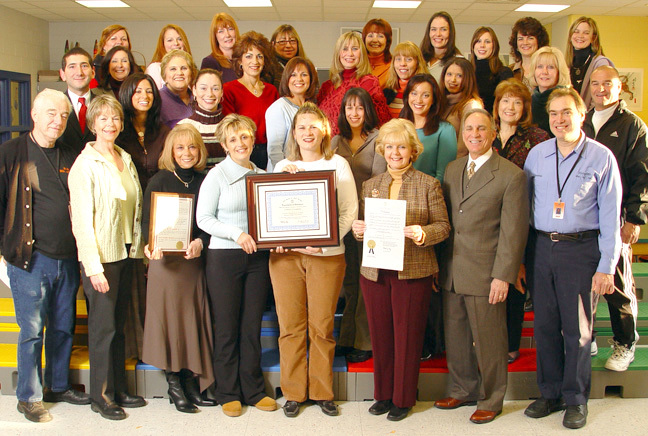 Lincoln Elementary School is the only elementary school in Bergen County to earn the Governors School of Excellence Award in 2005-2006. "These schools have shown they can give their children the best opportunities to succeed because of their marked improvement," said Acting Governor Codey. "They wanted to get better, and its no doubt their students benefited as a result." In its third year, the Governors School of Excellence Awards Program recognizes schools that show significant promise and meet five of nine criteria for two consecutive academic years. "These schools are excellent examples of how we can prepare our students for a 21st century workplace," Acting Commissioner Lucille E. Davy said. "Were thrilled to announce these schools today. Were sure they will sustain their improvement and keep providing outstanding opportunities for their students."  Other category: this is an area where a school may submit documentation that shows areas of significant improvement that may not fit one of the criteria above. Despite struggling previously, Lincoln Elementary School, Hasbrouck Heights School District now scores in the top 10 percent of schools in the entire State. The most dramatic statistical gain occurred in mathematics, where the percentage of the total population of students scoring in advanced proficiency more than doubled. Lincoln Elementary School has successfully initiated, executed and sustained new policies, procedures, school culture, and instructional methodologies that have elevated academic achievement. Mr. Luongo commented, "Dr. Ciccone, the staff, students and the parents at Lincoln School must all be commended for their team effort in the fantastic improvement of State test results." Dr. Ciccone stated, " I am thrilled to be part of such a dedicated and committed staff. The school communitys capacity to bolster student achievement is truly exceptional and worthy of great commendation." The school barely met AYP criteria (Adequate Yearly Progress) -- which corresponds to progress schools make on standardized State tests ... schools that fall below the AYP statistic are penalized and have to submit school-wide remedial plans to the State.